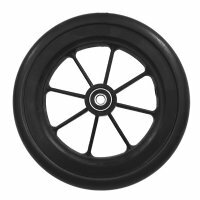 Wheelchair replacement 7" x 1" 5 spoke black mag wheel with a urethane tire. Wheel comes complete with 5/16" ID precision bearings. Hub width is approximately 1 1/2". Tire Size: 7" x 1"
You can earn 41 Ocelco Cash Reward Points on this product!